After I taught similar polygons, triangle similarity came next! I’m sharing the interactive notebook pages that I used for the second half of this unit. The first day, I only taught my students SSS and SAS Similarity. I used a foldable that only had SSS and SAS. I really wanted my students to get used to finding the corresponding sides. I knew AA would be easy for them, so by teaching it the second day, I was essentially giving my students a review day, with one small new thing tacked on. I’ve found that with some topics, this is especially effective. 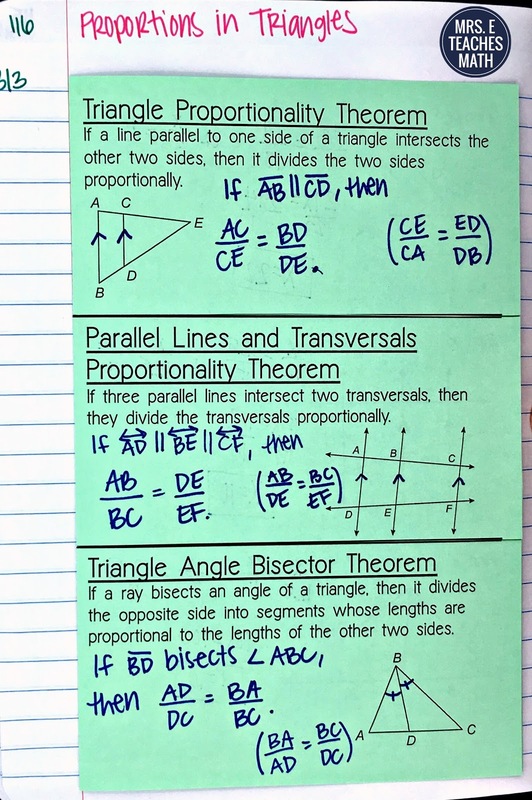 The next day, we completed a foldable and practice page with all three triangle similarity shortcuts. When I told them about AA, they thought it was easy after learning the other two rules. Then, we completed a foldable about similar right triangles. I liked that this foldable had the theorems typed out on the front. I split this lesson over two days. My students completed a practice page with their partners the day after the foldable. The last lesson in this unit was proportions in triangles. The flaps has the theorems written out, but there are examples under the flaps.